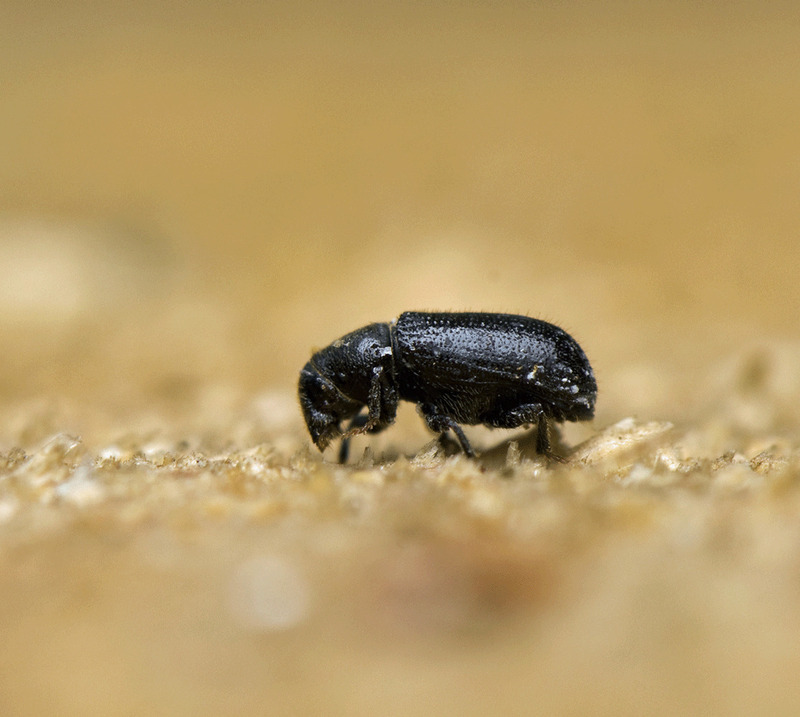 The presence of woodworm in a building can have seriously damaging effects to the structure, causing weakening and instability as the timber is eaten away. 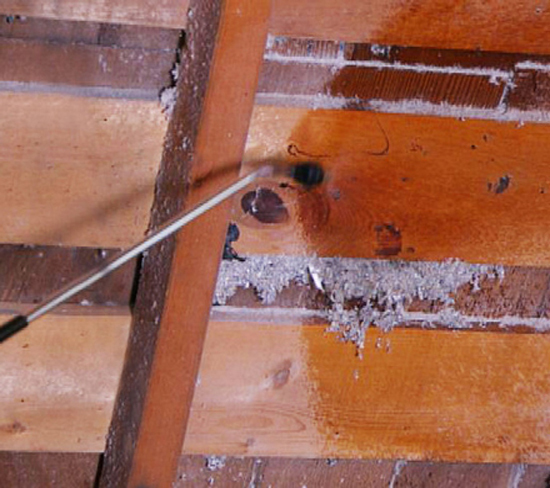 Identifying and treating woodworm infestations is therefore an essential part of structural maintenance and Twistfix provide a range of solutions to the damaging problem. The woodworm's life cycle is made up of four separate stages, each of which causes its own form of damage. 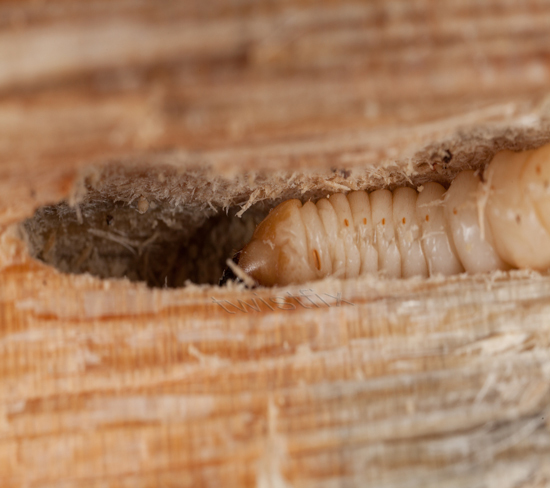 Beginning the process, a female woodworm will find a tiny crack in the surface of timber which she will widen, burrowing as deeply as she can before she lays many eggs in a downward-facing position. Just a few weeks later, these eggs will hatch, releasing woodworm larvae which, with a near-insatiable appetite, burrow ever deeper into the timber, devouring it and creating a myriad of tunnels that compromise its strength. Once finally satiated and at the last stage of larval development, the woodworm pupates, a process which further widens the tunnels they have created by eating the timber. This brings them closer to the surface in preparation for the final stage in their life cycle. Now a fully-grown adult woodworm beetle, the insect emerges by devouring the veneer of the timber and emerging, leaving a clear exit hole. Once free, they begin to mate once again and the process then repeats and continues to advance expo­nen­ti­ally. 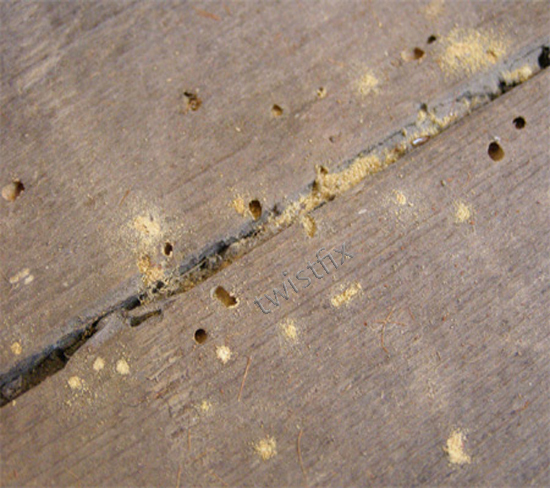 The constant boring of timber by juvenile woodworm leads to a visible dust which collects around affected timber; referred to as frass, this dusty residue is one of the first noticeable signs of a burgeoning woodworm infestation. In the later stages, exit holes (which are around the size of the hole created by a dart striking a dartboard) will become visible and fully-grown woodworm beetles may even be seen emerging or their dead bodies be found on or near timber areas. If left unchecked, a woodworm infestation will eventually make itself known through visibly crumbled boards and joists and, in extreme cases, complete collapse of parts of the structure. 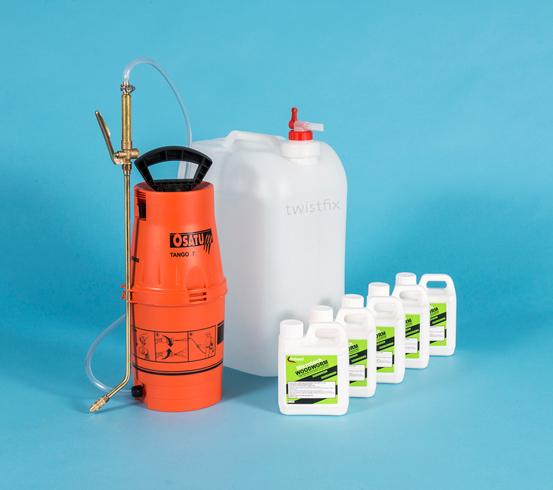 The Twistfix range of woodworm eradication and prevention solutions includes the professional Microtech Woodworm Spray Kit. This comprehensive kit contains everything required to achieve full eradication of woodworm whilst also protecting against future infestations of doors, doorframes, floorboards, rafters, joists and roof timbers in properties of any age or size. Intended for use only by professional contractors, Microtech Woodworm Treatment has a one-hour re-entry classi­fica­tion and is fully HSE (Health and Safety Executive) registered. As this product is so effective at destroying these small organisms, it is prohibited from being transported over water and is therefore unavailable for delivery to offshore locations. For further information and advice about woodworm infestation, please contact our team by calling 0845 123 6006 or email us sales@twistfix.co.uk.